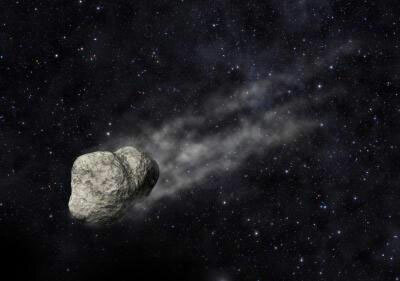 (Nanowerk News) Unlike comets, asteroids are not characterised by exhibiting a trail, but there are now ten exceptions. Spanish researchers have observed one of these rare asteroids from the Gran Telescopio Canarias (Spain) and have discovered that something happened around the 1st July 2011 causing its trail to appear: maybe internal rupture or collision with another asteroid. This is an artistic representation of asteroid P/2012 F5. "Our models indicate that it was caused by an impulsive short-lived event lasting just a few hours around the 1st July, 2011, with an uncertainty of 20 days," as explained to SINC by Fernando Moreno, researcher at the Astrophysics Institute of Andalusia (CSIC). In collaboration with other colleagues from the Astrophysics Institute of the Canary Islands and the University of La Laguna, the data have been published in the The Astrophysical Journal Letters ("A short-duration event as the cause of dust ejection from Main-Belt Comet P/2012 F5 (Gibbs)").